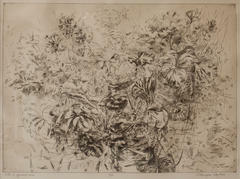 Olimpia Ogilvie exhibited her engraving, “Pots of Geraniums,” at the Print, Watercolor, Drawing show which accompanied the Fine Arts Festival held December 5 through December 15, 1965. At the time of the Festival, Ogilvie was a student in the Department of Art at the University of Iowa. She also exhibited an etching at the Fine Arts Festival Exhibition held March 31 through April 7, 1962. This etching was entitled “Remembrance.” No other information is available about this artist.